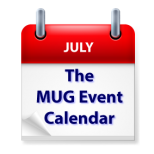 This week’s MUG Event Calendar ends with an appearance by Allison Sheridan at a California group, but before that, groups in Australia, New Zealand, and Texas will be talking about Apple’s WWDC announcements, a group in Illinois will discuss Adobe Muse, and Slack will be on the agenda at a Nevada group. Orange Apple Computer Club – Lets talk about iOS11 for iPad & iPhone. How does Photos work with iCloud? How does iCloud backups work? What are my backup options and cost?